If a pickup truck, please include details such as size/model, extended cab, 4x4, shell, diesel, etc. We provide our customers with the finest Auto Transport Service in the industry. Your vehicle is carefully handled and professionally transported in a timely manner. We understand that our job is not complete until your vehicle is delivered on schedule and in good condition. 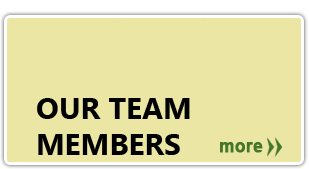 Our customers keep coming back for the courteous, professional and efficient service we constantly provide. You can be confident of dependable and ethical service, when you have Coast to Coast transport your vehicle. 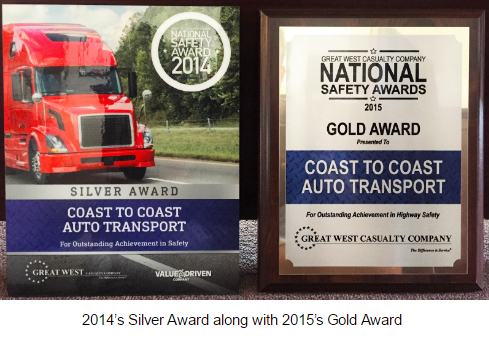 Coast to Coast Auto Transport has been selected by Great West Casualty Company to receive the Gold Award for outstanding achievement in highway safety for 2015. We were previously chosen to receive the Silver Award for our performance in 2014 and the Gold Award celebrates 2 full years without a single preventable accident on the roads. 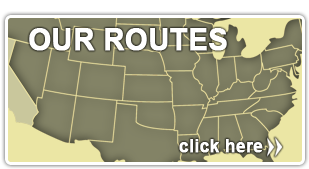 For 17 years, Coast to Coast has been dedicated to transporting vehicles across the country. This award signifies how safely our drivers complete that mission. None of our drivers were involved in any preventable wrecks in 2015, a huge accomplishment if we do say so ourselves. Driving a truck is no easy task and the best drivers are recognized for their outstanding skills with this prestigious award. Southeast Truck Coordinator Hunter Deere had this to say about the company receiving the award: “We have always strived to provide our customers with excellent customer service and experience while transporting their vehicles. 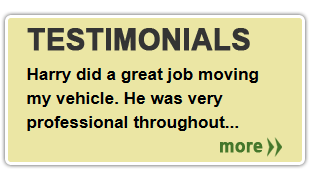 This goes to show you that our excellent drivers go above and beyond to handle your vehicle with the utmost care while in our position.” Coast to Coast Auto Transport continues to provide our customers with a consistent and reliable service that treats not just you, but your vehicle with the respect you both deserve. Getting to serve you is the greatest part of the job, so thank you for supporting our business and making us your choice of vehicle transportation since 1999.